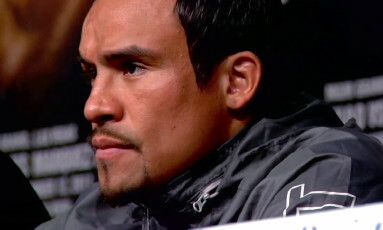 By Chris Williams: Juan Manuel Marquez (54-6-1, 39 KO’s) is looking like he’s going to be next for Manny Pacquiao (54-4-2, 38 KO’s) on December 8th in Las Vegas, Nevada in a pay per view bout. There’s no one left but Marquez and Tim Bradley, and it’s not going to be Bradley because he just finished beating Pacquiao in a fight that failed to live up to promoter Bob Arum’s expectations. The only question is what kind of deal will Marquez be able to wrangle for himself now that he’s the last guy. If he’s smart, he’ll hold out for at least a $10 million payday out of this. After losing two out of his last three fights in bouts that he arguably should have won, it’s the least that they could do for Marquez. If they don’t pay Marquez his asking price then he should walk and let Pacquiao and Arum select Bradley in a fight that will put boxing fans to sleep while at the same time angering them for having to pay to see it. I just don’t know what kind of interest there can be for a fourth fight between Pacquiao and Marquez. How do you sell that fight? People have seen it three times already, so why would they want it again? What will be different this time? I don’t think Marquez will ever be given a decision. If he couldn’t get a win despite dominating Pacquiao in the last two fights then I don’t see him ever being given a win. He’s about to 40. Maybe Pacquiao can actually beat him this time now that’s gotten a little older. I’m against promoters putting on the same fight over and over again just because it makes money. While I think it interests some fans, it turns away others who are plain tired of seeing the same old thing. Arum really needs to be thinking about the future by giving other fighters a chance at beating the aging Pacquiao rather than letting Marquez do it every time and not get credit for it. If Arum is going to put Pacquiao back in with Marquez then they need to discount this fight steeply to around $5 because how many times it’s already been shown. You wouldn’t expect movie goers to pay to see the same movie over and over again just because you can’t something else on.